Winchester produces this 9mm Service Grade ammo per their agreement with the US Army for the MHS program, and it's a fantastic round to practice with. Not only is this one of the most popular handgun calibers in the country, it's produced by one of the oldest and most reputable ammo makers in the US with over 150 years of experience. These service grade 9mm cartridges are fitted with newly minted brass casings with 115-grain full metal jacket projectiles snugly crimped into the tops. 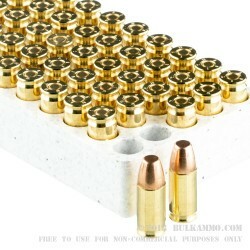 Boxer-primed and non-corrosive, the brass casings are perfect for shooters who enjoy handloading their spent casings. 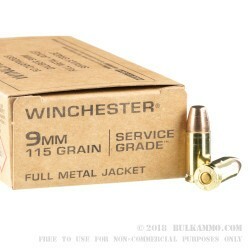 The 115 grain bullets fire accurately and with moderate recoil, and you will typically see muzzle velocities at around 1190 fps. 500 rounds of this 9mm Luger Service Grade ammo will serve you well on the range. Order your case today! I lost 18 out of a 250 round bulk pack. The last time I purchased 9mm. Winchester ammo I checked each round carefully and found 18 rounds that had the head and primer of the rounds smeared with pressure and some sort of tool. The cases would not fit into the chamber of my SIG 229 or Ruger but they wouldn't even fit into a RCBS shell holder. When I informed Winchester about this deformed brass and bullets (which should have been easily rejected by ANYONE in Quality Control) They offered to replace the 18 rounds AFTER they received my 18 rounds that had been severely deformed in the crimping process. The cost of shipping them back to Winchester was 10 times their worth so I told Winchester to kiss off. Even Helen Keller would have caught this mistake if she were working in Quality Control. Like the old saying goes..." It takes many good decisions to make a customer and only one bad one to lose them". 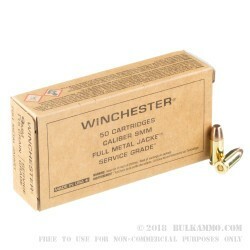 Q: What is the shipping charge on the Winchester 9mm 115 grain service grade (500) rounds? Thank You. A: The shipping cost will be based on weight and distance. To find this cost and any applicable sales tax, place the item in your cart and enter your zip code. This will provide you with an estimate for the shipping and tax.